Jensen’s JTK-87EXT1 Electronics Repair Kit consists of the JTK-87 tool set, featuring Extech’s EX530 heavy duty multimeter and MS420 digital oscilloscope. 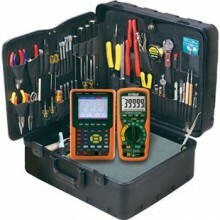 Field service techs can easily transport valuable test equipment and necessary tools in the Rota-Tough case. The customized foam compartment in the bottom of the case keeps the scope safe and secure, and the tool pallet has special pocket on the backside to accommodate the DMM. Please check the kits contents below to view the bill of materials and specifications for the Extech test equipment. Dimensions (ID) (L x W x D): 17-3/4 x 14-1/2 x 8"
1 of Beau Tech SH20A "SH20A SoLDER AID REAMER/ FoRK 8"" BEAUTECH"
1 of Ullman D-3 Slotted Screwstarter, 9"
1 of Ullman PD11-B Phillips Aluminum Screwstarter, 9"
1 of Jensen Tools 07-4161 Side Hinge Pallet With DMM Pouch F/ 87 Kits. 17-3/4 x 14-1/2"
Click the button below to add the Jensen Tools JTK-87EXT1 Tool Kit with Extech EX530 Multimeter and MS420 Handheld Scope to your wish list.